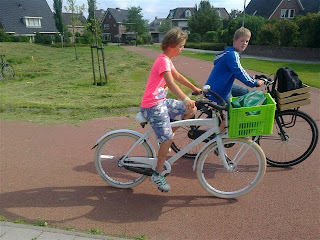 Last week I wrote about a planning proposal for a new primary school, at the Vauxhall Gyratory end of the Vauxhall, Nine Elms, Battersea (VNEB) Opportunity Area, to which no children are expected to cycle, despite Boris Johnson's statement that this area will be more cycle friendly than Amsterdam. 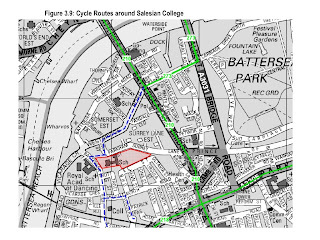 Bordering the other end of the Opportunity Area, Wandsworth have just granted planning permission for the St John Bosco College for 11-18 year olds to move into the former Salesian College site by Battersea Park . The exact location is shown in red below, in the vicinity of the Royal Academy of Dancing, Health Centre, College, Sports Centre, and two other schools. 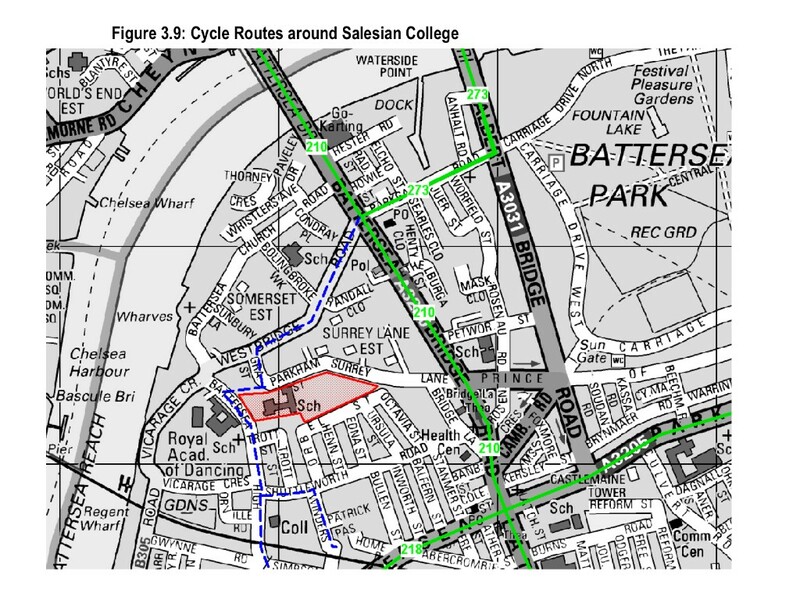 The map also shows suggested cycle routes, one of which is Cycling Superhighway 8. This flat area must clearly be an incredibly splendid cycling location, and, yes, you can cycle through Battersea Park, away from the traffic, though it isn't shown as a cycle route for some reason. 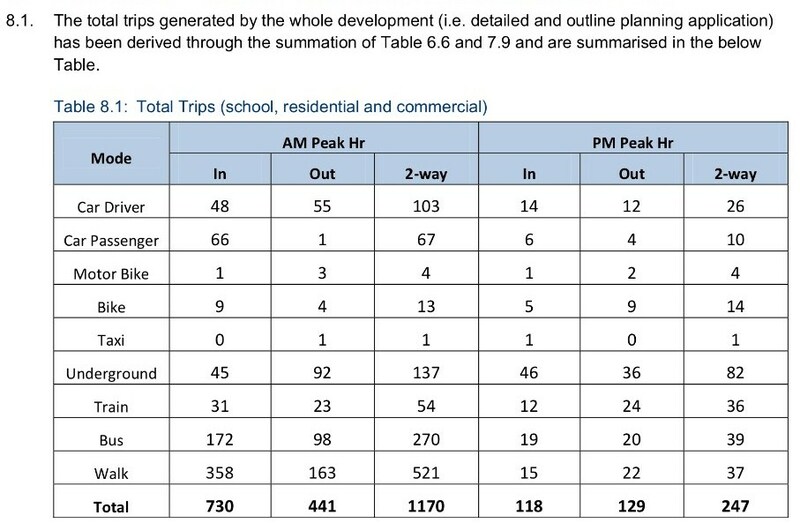 Let's look at the planning application's Travel Assessment to see the projected number of cycle trips resulting from the 1300 pupil secondary school and 110 staff, and the occupants of 104 new homes, the majority having two bedrooms and presumably children living there:. On weekdays just 30 out of 1500+ people, the vast majority too young to have a driving licence, are expected to cycle, with no-one cycling on Saturdays. I agree 'it is likely these possible figures could be higher for the Saturday results.' as they couldn't possibly go any lower than none. Maybe a time-lapse sequence of photos could be taken over a few years of the 141 cycle parking spaces for the school and 116 cycle parking space for the 104 homes that are required to comply with regulations. The map below shows bus routes and red boxes according to how many pupils come from where. Over the near future the number travelling from the existing site near Putney will decline and the red boxes nearer the new site will increase. How are the 11-18 year old school pupils expected to move around? 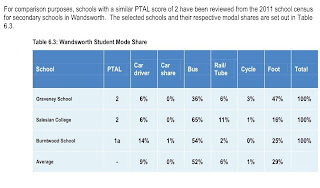 2% are expected to cycle, the same percentage as arrive by car..
68% however are expected to use one of the 110 buses per hour that run in the vicinity of the school. 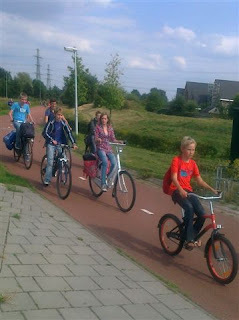 Maybe if you're under 16 you're considered too young to cycle to school? 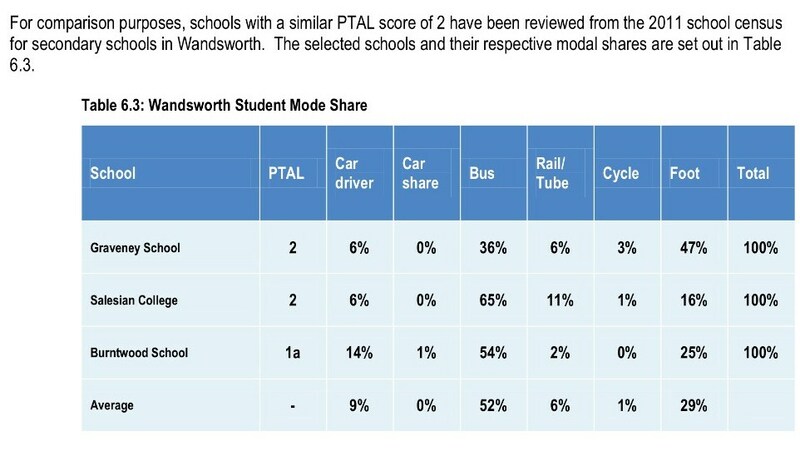 They're almost certainly right if the pupils are expected to share a cycling superhighway with the best part of 110 buses an hour. Could the cycling infrastructure be at fault? The Travel Assessment does makes some recommendations for potential improvements that could be provided as part of the development:- providing contributions towards the improvement of local peak hour bus services and better pedestrian crossing facilities to improve pedestrian safety to and from the local bus stop. There are no recommendations for contributions to cycling. 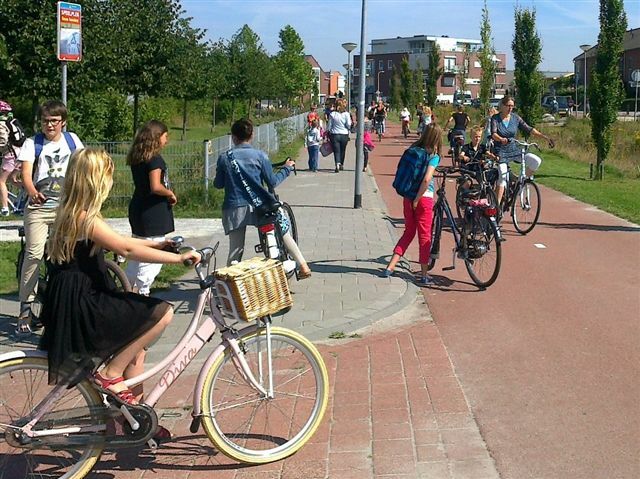 And there you have it - at one end of the 'more cycle friendly than Amsterdam' VNEB Opportunity Area a primary school is being planned with the expectation that no pupils will cycle to it; at the other end a secondary school is being planned with 25 out of 1300 pupils expected to cycle. 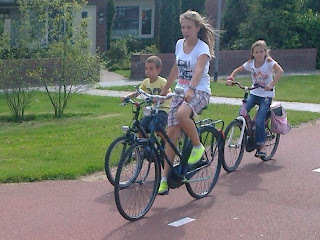 Long live the cycling revolution. 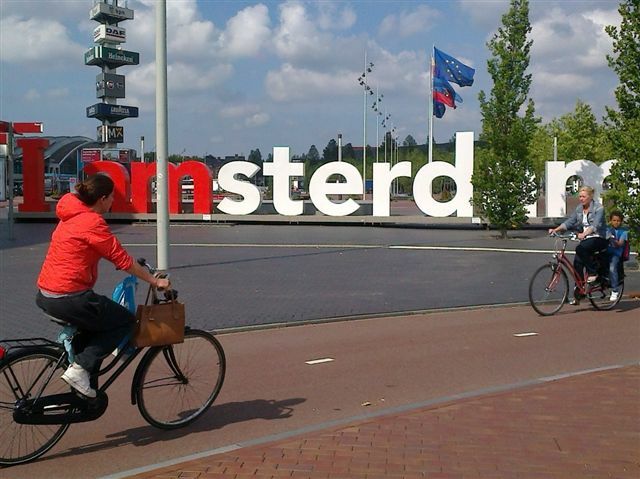 Vauxhall 'More cycle friendly than Amsterdam'? "Lambeth will be the most cycle-friendly borough in London, where 8 – 80 year olds feel safe enough to cycle." 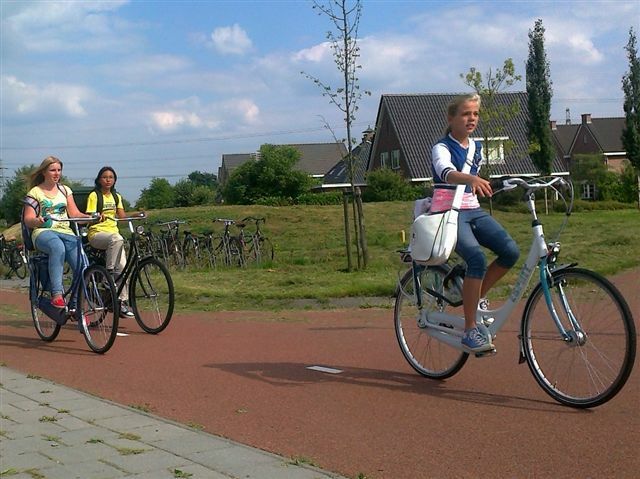 "Aim 7: Increase the number of children cycling and make cycling to school the norm." 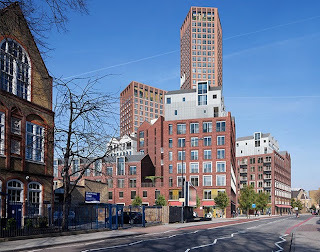 In Vauxhall BT and its development partner Telereal Trillium have submitted plans (type Keybridge in key word box) to replace the Keybridge House building on South Lambeth Road, opposite Fentiman Road, with 415 homes, a 420 pupil primary school, and a number of shops and commercial premises. The Transport Assessment (August 2013 by Waterman Transport and Development Limited) supporting the planning application for the new development makes profoundly depressing reading. The 415 homes, 420 pupil primary school, and shops etc. 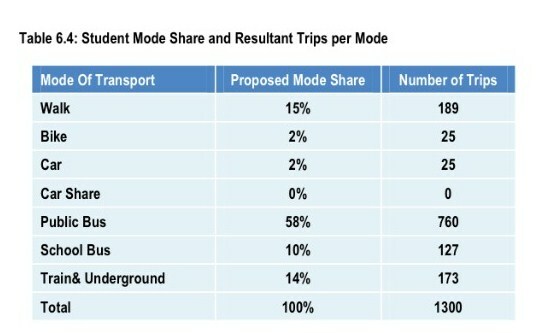 on the site are expected to result in 1170 trips in the AM peak hour of which just 13 are anticipated to be by bicycle. 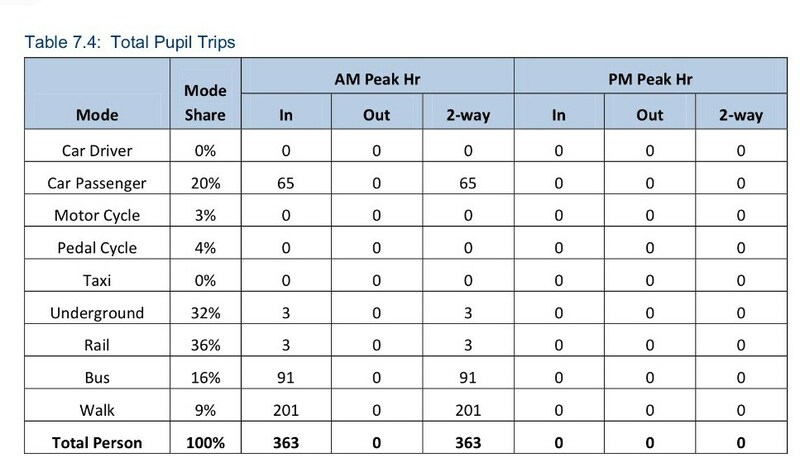 Looking only at the school in 2021, 65 pupils are expected to be dropped off by car; 91 to arrive by bus; and none to cycle. The developers will install the 610 cycle parking spaces required of them to fulfil planning obligations for the 420 pupils, 1000+ residents, and 100 plus business users and, positively, some is on the ground floor. Most however is alongside the 115 car parking spaces and lorry drop off area in the basement, with a narrow cycle access ramp (adjacent to a lorry ramp) that leads to a narrow pavement on Wyvil Street, a rat-run without a segregated cycle path.. In addition, 'Child-friendly' Miles Street also houses the entrance to the service vehicle yard, which is capable of accommodating 10.7m articulated lorries. The completed development is expected to be serviced by 13 light good vehicles and 3 HGVs per day. The plan also anticipates service vehicles using Pay and Display bays and Resident Parking bays along Wyvil Street and Miles Street. 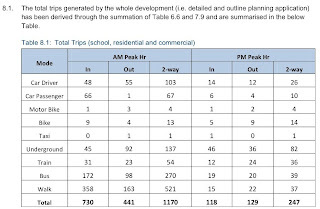 As for the homes (many two or three bedroom), this car-lite development forecasts that twice as many residents will drive out in the morning as cycle (18 vs 7), while 156 are expected to take the underground or bus when, surely by 2021, there will be better cycling conditions than Amsterdam. 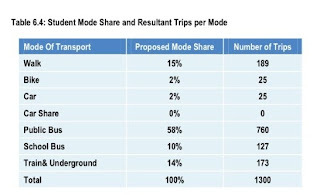 Given such good cycling conditions and the central location, why would so many people choose to pay money for a slower journey on a crowded bus or tube when it will be cheaper, quicker and comfortable to cycle?. The crazy thing about this is that there are obviously tens of millions of pounds available to spend on making this highly populated area supremely cycle friendly, given the huge political will, Community Infrastructure Levy, and that there's no problem in splurging £1.2 billion on a two station underground extension. 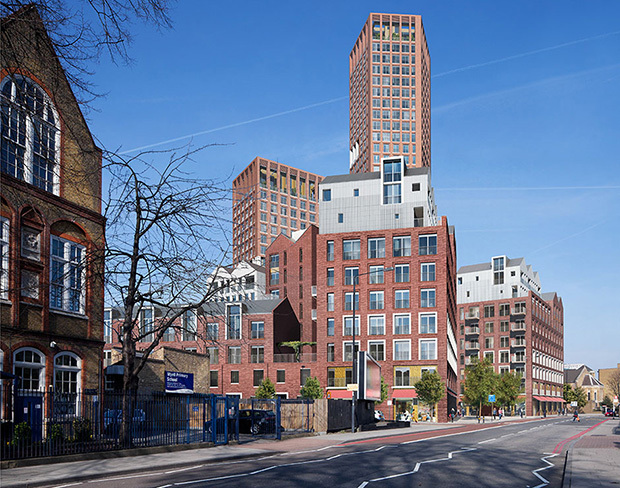 However I haven't seen a single image that conveys the Vauxhall, Nine Elms, Battersea area as sensationally cycle friendly, and I'm willing to bet the developer, architects and transport assessment writers haven't either. The result is that transport assessment writers don't anticipate cycling; architects don't go all out to design cycling friendliness into the building; kids won't cycle to school; the home occupiers will find it more convenient to walk to the bus than dig out their bike, and the chance to achieve a transport revolution will have been lost. It's time that all the bodies involved in the VNEB area pulled together together to ensure that children, like the ones pictured above, have got a space to cycle in that is better than Amsterdam, and also portray it as such. 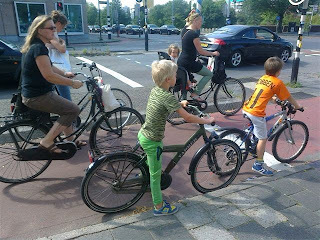 Alternatively, as this planning application proposes, the children will grow up in a noisy, polluted area, failing to develop the fitness to give them a long life or the mobility to be able to cycle independently to school or visit friends at an early age. 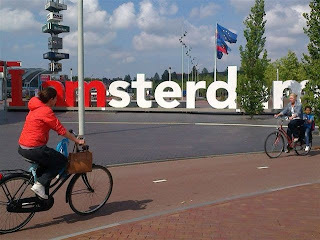 (The photographs from Amsterdam, Assen and Grongingen were snapped on a recent visit to the Netherlands for a cycling infrastructure Study Tour organised by David Hembrow. I highly recommend his blog and his Study Tour). 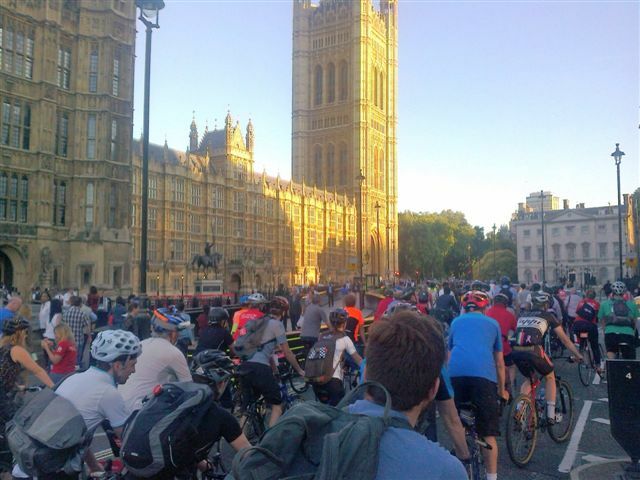 On Monday thousands of cyclists seeking clear 'Space for Cycling' attended a protest ride around Parliament, where MPs were discussing how to 'Get Britain Cycling'. There is cross-party consensus that getting people riding their bikes is to be encouraged with regards to health, environment, pollution, congestion and economy. It's also recognised that people prefer to cycle away from motor traffic and that it is safer to do so. It is important, however, that those seeking change do not set their expectations too high. As an indication, expect that it will take over a year and half, with a few reminders, to have 'except cycles' added to 'No Entry' signs in a place where cycling is already legal. Can you please let me know why there is not an exemption permitting cyclists to cycle along the Mall and Marlborough Road on a Sunday when the road is closed? It would seem an excellent opportunity for families to cycle there, especially as it is part of a recommended cycle route. Do you have plans to permit cycling on these roads on Sundays in the future? Your e-mail regarding not being able to cycle on the Mall on Sundays comes as a surprise to me, and to our police inspector also, in that we do permit such exemptions! I certainly am passed by many cyclists on the Mall when I am doing my rounds on a Sunday. The only time this is not the case is if we have a specific event on - such as this coming weekend when we host the Sport Relief Mile - or whilst Changing the Guard is taking place. If you have been prevented from doing so I suspect it may have been by officers tasked from other areas who may not be especially familiar with the park? I do apologise if this has been the case and my Inspector has reminded his officers that this is something we do permit, on the consideration of course that the activity being conducted is in such a manner that it is not discourteous or a danger to others. 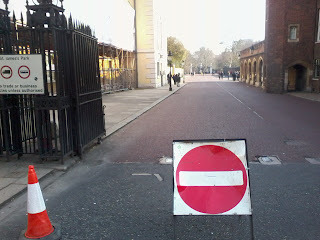 Given the Royal Parks' intent that people can cycle on the Mall and Marlborough Road on a Sunday can you please arrange to replace the temporary 'No Entry' signs you currently use (photo attached) which the law states applies to vehicular traffic, including pedal cycles, at the entrance to the Mall and Marlborough Road with the 'No Motor Vehicles' sign (flying motorcycle over car) or have the recently permitted 'Except Cycles' added beneath the 'No Entry' signs? Thank you for your suggestion. We will give this some consideration. It'll be great if these can be corrected. I teach cycling to pupils in Westminster schools, including not only the meaning of 'No Entry' signs, but also of course the importance of obeying signage including the 'No Cycling' and 'Considerate Cycling Permitted' signs in the Royal Parks (normally Kensington Gdns/Hyde Park/Regents Park) that we visit on Fridays! ...and of course you are absolutely right! I am just surprised that it has taken over 20 years for anyone to raise this with us or even for ourselves to notice!! I need to look at my budget and at what signs are available. If we are unable to replace outright it may be a phased introduction as and when other signs get damaged. You may remember we had an exchange of emails a little over a year ago concerning the incorrect signage for the Mall etc. on Sundays when cycling is permitted but 'No Entry' signs are used, which apply to cycles also. 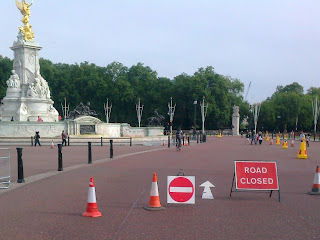 On Sunday a pedestrian took great exception to me pootling on my bike on the Mall and, unsurprisingly, wouldn't accept my statement that cycling is permitted but the signage is wrong. A policeman by the 'No Entry' sign at the entrance to Horse Guards Road confirmed that cycling is in fact permitted. Can you please let me know when you will be changing the signage? I'm sorry to learn that you have been harangued. We did start looking for off the shelf signage but could not find suppliers, and did not have funds available at the time to commission bespoke signage. With your reminder we shall again explore the possibility of doing so. http://roadsignsdirect.co.uk/road-signs/cars-and-motorbikes-prohibited riveted,superglued or similar over your existing signs should do it I reckon. Thank you. However I was thinking along the lines of 'Road closed except for cyclists' but will ask our H and S manager and police for their view also. Now it's September and the 'No Entry' signs still haven't been corrected. When will the correct signs arrive? We hope to have the new signs on site in October 2013. To save on cost we are looking at purchasing a few different bespoke signs at the same time from a supplier. There has been an exchange in correspondence regarding the images on these signs which are both appropriate and legal for use in St. James's Park. We are nearly there with our procurement of these signs. The signs have not been replaced.